As for this atheist critique of Mormonism, 1) it's true LDS think God's a space alien (although they'd never use these terms), who created and organize only this world or certain other worlds, but not all worlds whatsoever. 2) They baptize *for* dead people (not corpses as the atheist billboard would imply to those who don’t know Mormonism). 3) They are into big money (7 billion each year from tithing). 4) Bigotry probably has reference to two things—a) the LDS Church being against gay marriage, including labeling the practice of homosexuality as sin, and b) God cursing with dark skin in their own scriptures, and many LDS thinking (on the basis of an official 1st Presidency Statement, August 17, 1949) that blacks got their skin because they weren’t as valiant fighting against Satan in the pre-earth life. The gay marriage issue is quite problematic, and not only accuses Mormons of being bigots, but also most people in the world who think that marriage only being between a man and a woman is the best for a flourishing society. Many of those who think this way love those who think otherwise. This way of thinking also includes those who love the sinner, but hate the sin of homosexuality. As for this atheist critique against Christianity, 1) claiming God is “sadistic” is myopic. It finitely presumes on the Almighty how evil ought to be eradicated on their time-table, and it overlooks all the other reasons we have for believing in an omnibenevolent God, including 2) how useful the Savior was in dealing with it. 3) “30,000+” is probably a reference to the versions of the Bible, but so what? There are a potentially infinite amount of ways to get the point across. 4) As for promotes hate and calls it love, this is also myopic. Just because one claims to have truth doesn’t entail one hates. If that wasn’t the case, then these atheists are also promoting hate by putting this billboard out. Final note to Mormons and Christians: Stop responding to this billboard on the basis of how you feel. Deal with it factually. Final note to atheists: Big Bang from nothing or if something, you have mere theories without any evidence; the intricate design to have life function is a mere coincidence without any personal involvement; no ultimate purpose to life; the same justification for walking an old lady across the street is also used for running her over—it just comes down to what you like; there is no Design plan of the way things ought to be, nor is there any genuine freedom, since there’s only matter bumping into more matter. 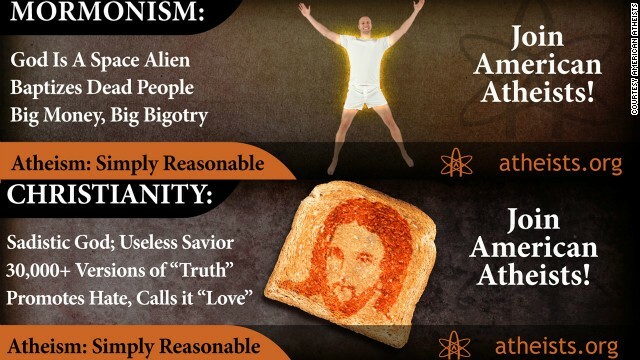 Final note to all: Atheism: Simply unreasonable. Christianity: Simply reasonable.